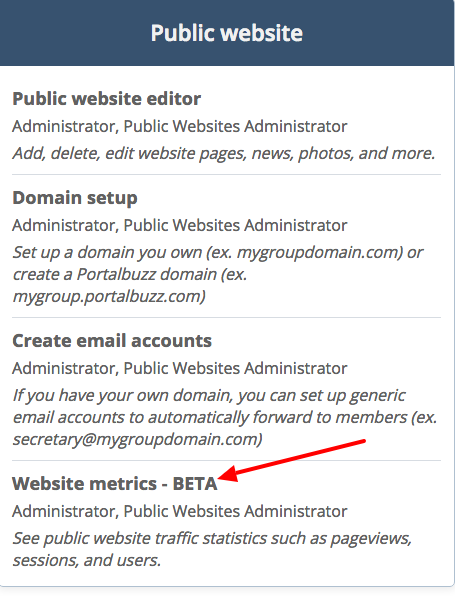 This article will show you how to configure the site metrics of your public website. Website metrics are a set of standards to measure, understand and analyze your site in order to improve its performance . 2. Under the Public Website heading, select Website metrics. 3. Click the Configure button. 4. You have the option to use the built-in metrics or configure your own Google Analytics account. To use the built-in metrics, select Built-in Metrics from the dropdown then click the Save button. Built-in Metrics has three available metrics namely pageviews, sessions, and users. Pageviews: The number of times any site pages are viewed for the given day. Sessions: A series of page requests from the same uniquely identified client. Users: The uniquely identified client that is generating page views within a defined time period. In the case of these charts that time period is a day. Important! If you want to use your own Google Analytics account to track the website metrics instead of the built-in ones, follow the instructions here. Note: After configuring this option, it will take a day before you start seeing results.